One of the beautiful lessons I learned, while in California last month, was how to "capture more." I loved being with other artists and photographers for five days straight. I only have a few family members that are "life artists" and to hang out with five others made my heart sing! Lindsay picked up my phone during lunch and snapped this photo. She saw that the lighting was perfect and so was the opportunity and she took it. There were so many times I watched these women take the time to enjoy and capture life. It not only taught me to capture more of my every day but also to look for beauty everywhere. I realized when I did, I was more grateful for the little things. 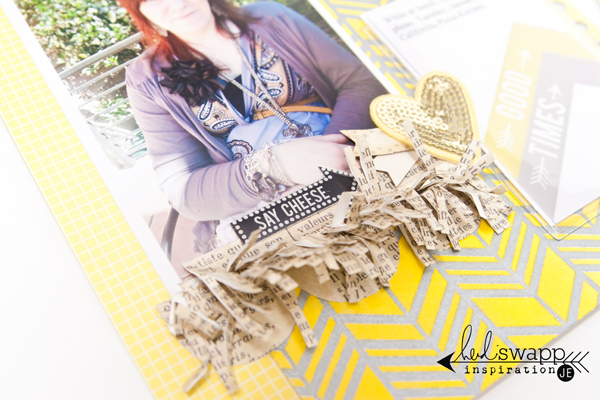 These pages were created with new Serendipity, Color Pop, and Clear Pop products by Heidi Swapp, shipping in March! Create Well: Look for beauty everywhere.